FRISCH renovierte Wohnung. Neue Matratzen in allen Zimmern, neue Möbel, neue Waschmaschine und Trockner, neue Möbel. Wir vermieten nur Samstag bis Samstag während Peak Spring und Peak Somer. Wir können keine Online-Buchungen, die weniger als 7 Tage oder für Mietdaten, die an jedem Tag außer Samstag während der gelisteten Fenster beginnen. Schöne Aussicht von dieser gepflegten zweiten Etage in Watercrest. Einheit hat zwei Hauptschlafzimmer (mit Kingsize-Betten und eigenem Bad), die auf den großen Balkon öffnen und die Aussicht aus dem Wohnzimmer ist unglaublich. Genießen Sie den Sonnenaufgang oder den Sonnenuntergang vom Balkon oder entspannen Sie sich im Wohnzimmer, während Sie eine DVD oder einen Film aus der Filmbibliothek (über 100 DVDs / VHS-Kassetten) genießen. Das dritte Schlafzimmer hat zwei Queen-Size-Betten. Der Schrank ist mit Wasserspielzeug, Boogie Boards und Brettspielen für die Familie ausgestattet. Fühlen Sie sich frei, sie zu benutzen, stellen Sie einfach sicher, dass die Kinder sie zurückbringen !!!! Der Komplex verfügt über einen Fitnessbereich direkt gegenüber dem 2. Stock. Der Poolbereich verfügt über einen Whirlpool und ein Kinderbecken. Es gibt einen Tennisplatz, einen Shuffle Board Court und einen Handball Court. Mein Ziel ist es, die Unit 207 in Watercrest zu Ihrem Urlaubsziel zu machen! Sie werden einen der entspannendsten Urlaube Ihres Lebens genießen. Familien und Rentner sind willkommen. NICHTRAUCHER & KEINE PET-Einheit. Früh buchen, Sommer Wochen füllen sich schnell wegen der niedrigen Etage und tolle Aussicht! Das Hotel liegt an der Ostseite des Thomas Drive. Hauptsaison Vermietung ist Samstag bis Samstag. Einchecken 4 p. m. Schau dir 10 a an. m.
Great property. Lots of space and it had everything you need. Loved the view from our balcony. Owner was very nice and made sure we had a great vacation. I will rent again. We had a great week! Loved the location and being on the 2nd floor! Condo was great and Cort was wonderful to work with. I would text him with a question and as soon as it was sent, my phone was ringing with him to answer! Would definitely recommend this condo!! There were several broken and malfunctioning items in the room when we arrived and the owner is attempting to force us to pay for them. This stay was a scam. I will never use this company again. I spoke with the renter the day they checked in and gave them the door code. I reviewed the resort policies and informed them to reach out if there were any issues. The renter called me the day of checkout and informed me they did not have any laundry detergent and couldn’t wash sheets and towels as needed. I informed them to leave towels and maid would handle. I asked if there were any other issues and she said no. 1) Red koolaid stains on rug. 2) Dishwasher was flooding kitchen. Renter used regular dish soap in dishwasher. 3) Black stains on sofa and love seat from dirty shoes/feet staining armrest and cushions. 5) Two burned pans that had to be discarded. 6) All furniture displaced and had to be reset in den. The individual that rented the unit ended up not being the main point of contact on site. Original renter paid the additional Damage fees for the damage to the condo that exceeded the Security Deposit on File. We take great pride in our unit and work diligently to provide great accommodations to our guest. We also provide guest with the option of purchasing additional damage insurance with their rental to cover any damages that occur while renting. The property was great. It was everything we expected! I have nothing bad to say about this condo. It was a great condo. Accommodated our whole family of 8 perfectly. This is our favorite beach vacation spot! 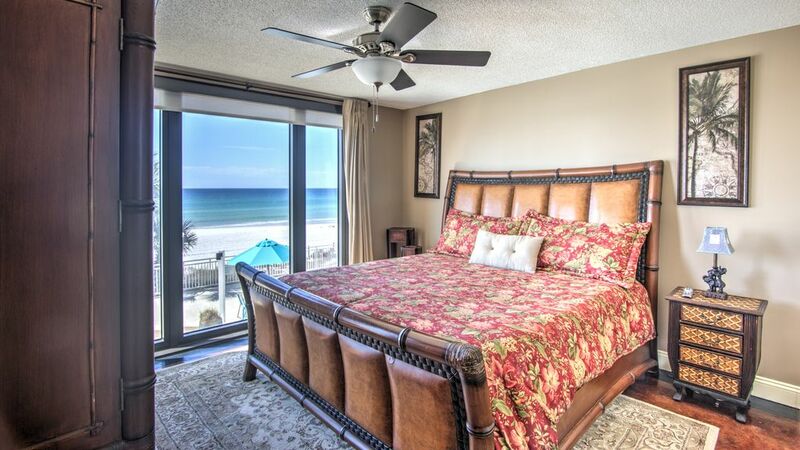 Located right on the beach with great views. Loved the property and the owner is great to work with. I just wish we could have stayed longer but due to the hurricane, had to evacuate. Sorry your Trip was cut short. Biltmore Beach ist auf der recht Seite Thomas Drive. Der Strand ist sehr breit und ermöglicht es Ihnen, mehr Platz zu genießen, wenn Sie sich für den Tag. Restaurant Schooner liegt nur einen kurzen Spaziergang am Strand entlang, und Sie können sich für ein schnelles Mittagessen zu gehen oder zu trinken am Strand Deck. WE ONLY RENT OUR UNIT SATURDAY TO SATURDAY DURING SPRING AND SUMMER MONTHS. WE DO NOT SPLIT WEEKS OR RENT ON OTHER SCHEDULES BECAUSE IT CREATES OVERLAPS IN RENTAL DATES FOR GUEST NON SMOKING unit. If you smoke in the unit you will forfeit the security deposit. Complex requires a renter of 25 years of age in each rental unit. If you violate this policy and are evicted you will not receive a refund.